So where did the Bible come from? What about before the Bible? 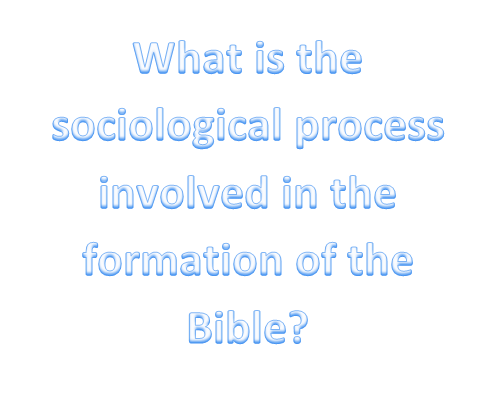 Rather than describing the process theologically, that is, in terms of how God spoke or what the role of humans was in the process, we can talk in terms familiar to the non-believer: Sociology. 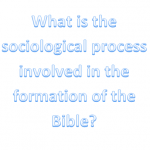 What is the sociological process involved in the formation of the Bible? Many see the Bible primarily as a collection of reflections about the nature of God, by various people who were skilled at poetry. Certain people at various times certainly did interpret events in their lives, and as a result meditated on the nature of the divine. Sometimes such meditations have even made it, eventually, into the Biblical account. But this accounts for a mere smattering of texts throughout the Bible. Many texts thought to be personal reflections, for example in the psalms, are more likely to have been a liturgical device designed for the edification of the Assembly (the worshippers). That means this is an inadequate view of what the Bible is, and where it came from. Far more often, certain people at various times interpreted events in the history of their people within a particular pre-supposed worldview (that of a benevolent, all-powerful God who had chosen this particular people group for his own purposes). This interpretation process happened particularly at times when the nation faced a crisis and needed to comprehend their circumstances within the paradigm of this benevolent, all-powerful God of the nation. It was precisely this contemplation that led to the concept of a “people of God”, a term meant to mark out a people as instruments of God, but which all too often is used to imply a people marked out as beneficiaries of God. The two are not mutually exclusive, but neither are they supposed to be conflated in that way. For example, the people of God are sometimes called upon to suffer for the sake of others. Jesus revealed this aspect as a key one in the purposes of the people of God. Even assuming, as some scholars do (although I don’t: See my article on that topic), that every supernatural occurrence in the Bible is the stuff of legend and myth, the historical accounts are nevertheless demonstrably didactic (instruments of teaching), rather than simple historical accounts. Not only are they reaffirming the faith worldview of the people, but importantly, they aid the community’s interpretation of contemporaneous events. This is the very last verse in the Hebrew Bible (which is arranged differently from the Christian Old Testament), concluding 65 chapters (1 & 2 Chronicles) of a rolling “this-is-your-special-heritage-as-God’s-people” narrative, which starts with 8 full chapters of genealogy (beginning at Adam and Eve). The whole story constantly reveals how privileged the Israelites are, how much of a disappointment the people have been to God, and therefore how forgiving their God is in still bearing with them. It ends, pregnant with anticipation for what God will do next, inviting the people to come home and participate in it. Their God, Yahweh, who had given them the Holy Land, established their monarchy, fought with their armies, defended the capital city against invaders, inhabited the Temple, and who had promised to look after them and protect all of those things, apparently had failed them! The walls of the city had failed, the armies were defeated, the monarchy shattered, the temple obliterated, and the people removed from their land. The prophets, however, described the situation differently: It was Yahweh himself who had turned on his own people because they had so completely abandoned his ways, but he (Yahweh) was nevertheless willing to forgive them and restore them. Indeed, Yahweh had the power to manipulate international politics so that the people would be restored to the Holy Land, even after having been violently removed by an opposing superpower. Such was the goodness and power of their God, and such was his love for them. Of course, that would be meaningless wishful thinking, except that this is precisely what happened. Ah, well that’s where it gets interesting. The God of the Hebrews was the only God, whereas surrounding religions talked about a pantheon of gods. The God of the Hebrews created the universe merely by speaking, whereas surrounding religions thought that the universe was either “evil”, created as a plaything for capricious gods, the result of sexual perversion by the gods, created by a demi-god in defiance of a higher god, or in various other ways conceived of as a “problem”. The gods were to be appeased to avoid too much temporal trouble. The God of the Hebrews was superlative goodness, mercy, justice, love, peace, authority, etc., whereas the other religions dealt with primarily animistic gods of various shades of favour and ferocity. The Hebrew knew mankind as having been created lovingly in the image of this God of all noble thought. The other religions saw humanity as disgraceful, pitiful, wretched, and created in various perverse ways. The Hebrew saw the observable human penchant for sinning as the fault and responsibility of mankind, whereas the other religions either celebrated it or excused it on the grounds that the gods were malicious and perverse. The Hebrew saw a God who was infinitely merciful in forbearing the incorrigible, delinquent, recalcitrant people whom he loved. Where did that radically counter-cultural worldview come from? All we know is what the Bible says about it: God spoke to certain people in order that they should come to know his true nature, and then advertise it to the world by becoming a people (a ‘nation’) who manifest that nature. It was a very strange set of beliefs, by contemporaneous standards. We simply don’t have any sociological information that provides a source for them, aside from the story which says it came from God. That was the assumption of all those who wrote the subsequent Biblical documents. No wonder the prophetic and other religious literature produced by the people became so valuable to the community over time. In various stages, particular documents were assembled in a way that reflected their value to the nation, in contemplating this benevolent and all-powerful God. 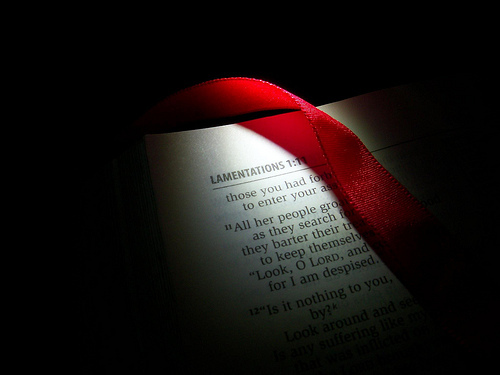 Often these texts became incorporated into liturgy and lectionary. Ultimately, that collection became the Hebrew “canon” of Scripture, which means that it represented the complete set of authoritative documents for the community. Again in the Christian context, as the Christian communities developed, they suffered various forms of persecution at various times both from the Jewish community and from the Roman Empire. Within that experience, encouragements and instructions were written by the leaders of the Christian community and circulated to the churches. These encouragements again interpreted historical events within the particular worldview of the Christians, and applied that interpretation to contemporaneous situations. Commonly, the application was either to remain faithful to Christian orthodoxy in the face of “false teachers” (usually either schismatics or Jewish anti-missionaries), or to remain spiritually faithful in the face of brutal persecution and execution. These documents became, particularly in the heat and zeal of persecution, cherished by the churches. Over a couple of hundred years, particular documents became very widely accepted and acknowledged as authentically “apostolic” (coming from an apostle), whereas countless others were discredited or enjoyed only limited support. When Emperor Constantine made Christianity the official religion of the Empire, he ordered that all the bishops should meet and decide which documents are to be officially recognised. That meeting produced the canon of the New Testament (and of the Old), based on the recognition of which documents had been most widely accepted and relied upon for up to three hundred years already. In such a brief account I can’t do justice to the various nuances remaining, like the difference between the various “canon” definitions of the Hebrew Bible among Jewish and Christian groups, and of the New Testament between certain Christian groups. Suffice to say that the canon, however it is defined, has been formed by the people. This is not a democratic process, but a sociological one. In both the Old Testament and New Testament cases, the canon was formed over a period of many generations, and reflects what the people of God considered to be authoritative. 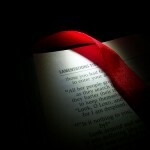 In this sense, the Bible is “the Book of the people” – (the “people of God”).